Please Help us Feed the Hungry! Every day, many homeless and needy men, women and children turn to the Albany Rescue Mission for help. We sincerely need your help! For 20 years, we have been providing for those in need by sharing food, shelter, and the Good News of the Gospel of the Lord Jesus Christ. Our feeding program is extensive … serving more than 7,000 meals each month. In addition to our residents, we also serve 3 meals a day, 7 days a week, 365 days a year to anyone who comes. all the meals in between! Because of our strong Christian stand, this ministry does not receive government funding, and therefore, we rely on God’s provision through private donations. The lines are often long for the meals we serve. We don’t want to turn anyone away. Your gift will help to feed the hungry. May God bless you richly for helping those in need. For I was an hungred, and ye gave me meat: I was thirsty, and ye gave me drink: I was a stranger, and ye took me in: . . . And the King shall answer and say unto them, Verily I say unto you, Inasmuch as ye have done it unto one of the least of these my brethren, ye have done it unto me. Your monetary donation is tax deductible -- tax ID number 58-1878316. Please e-mail secretary@albanyrescuemission.org with any questions. Just purchase the items on the list below, fill a grocery bag, & give it to the Mission. We’ll distribute the food to those in need. To participate & obtain materials, or to arrange for a pick-up, please contact us at 229-435-7615. 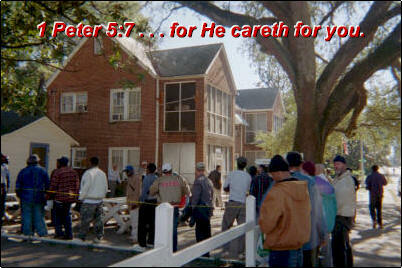 Drop off food bags at the Albany Rescue Mission Office (604 N. Monroe St., Albany, GA). "Let’s Feed a Family of Four"
1 package of pasta, rice, etc.